Have you encountered any fools lately? I know, I know. The Bible teaches us to beware of calling other people fools. Unfortunately we either seem to ere on one side or another of that command. Either we think that means we're going to be zapped immediately if we dare label anyone a fool and so we tiptoe around the fools in our lives or we completely ignore the admonition and just go around calling anyone and everyone who gets in our way a fool. But it is wise to come to terms with the fact that there are indeed some fools out there. If there weren't, the Bible wouldn't have so much to say about them. And it does have a lot to say about fools -- how to keep from being one, how to spot one, how to deal with them. Indeed, most of us have a fool or two in our lives. Some of us have the misfortune of being married to one, raising one, being raised by one, working for one, or having one work for us. In other words, some of us have to deal with a fool on a day-in-day-out basis. We love a fool...as crazy as that may sound. Recently my daughter had to contend with a fool in her life for quite a spell of time. Because my teenaged daughter was dealing with a fool, I was too. She's my daughter, hear me roar! Dealing with a fool is unlike any other dilemma I've ever faced. You see, they don't play on a level playing field. They don't abide by the normal rules of etiquette, truthfulness, civility, or fair play. They don't think like normal people. And all the time they're behaving abnormally, they're telling you that you're the abnormal one and swearing up and down that they are as normal as it gets. Lord help! The Bible really does tell us how to relate to fools. If you live with a fool, work with a fool, go to school with a fool, interact with a fool, I suggest you stop trying to treat your fool the same way you treat everyone else. It won't work. It just leads to frustration and defeat. At first that sounds like double talk. But here's what I think the wise writer of Proverbs is saying: Don't treat a fool the way he treats you or you'll end up being a fool. But once you've studied your fool, examined his or her actions and words carefully, prayed about your fool, and gained a little insight into your fool, respond to him according to who he really is -- a fool -- or he'll just end up getting the upper hand. Bottom line? You can't fool around with a fool. You've got to wise up to handle a fool. Well here's where I'm going with this. Obviously I can't tell you exactly how to handle your fool in this blog post. But I can direct you to a mighty helpful resource that a friend passed on to me. Jan Silvious has written a handy little book for fool victims. It's called Fool-Proofing Your Life: How to Deal Effectively with the Impossible People in Your Life. I recommend it highly. In our situation with our daughter's fool, we put some biblical principles into practice, prayed long and hard ( and I do mean long and hard -- my husband even fasted for a period of time), treated the fool with discernment and godly wisdom, and we've made some progress. I learned so much through this process. I wouldn't wish a fool on my worst enemy, but in the long run interacting with a fool made me a little wiser. If you live with a fool, work closely with a fool, or love a fool, don't give up hope. I know it can be wearing. I totally get that. But instead of playing their games or banging your head against a wall, wise up. Check out what the Word of God has to say about relating to a fool. 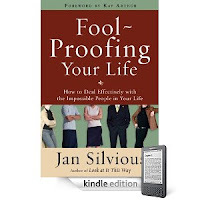 You'll find much of that summarized and nicely packaged in this book by Jan Silvious. Hey, I'd like to know: Do you deal with a fool on a continuous basis? Or have you in the past? What' one important thing you've learned from your relationship with a fool? I don't want us to be pious here. But I do want us to offer each other a word of helpful advice if we have it to give.